After the foam is compressed, the ischia soon detect the rigid support, resulting in discomfort and increased fatigue due to intense local pressure. Every PT chair is manufactured using this highly ergonomic system that frees the body from any contact with a rigid surface. Braided polyethylene straps stretched over a tubular steel frame ensure comfort, lightness and well being. 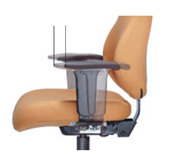 As the chair tilts back, the front edge of the seat cuts off leg circulation. Feet lift off the floor. 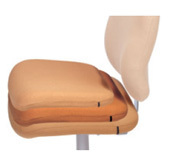 The front third of the seat nose tilts downward, ensuring that the pressure under your hamstrings remains constant, regardless of your sitting position. Your feet stay flat on the floor. Since both small and tall individuals need to have their arms positioned properly along the side of the seat. we has developed an attachment that allows the arms to be set at two positions and adjusted on-site without tools. 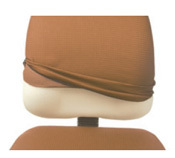 Equipped with zippers on the underside of the seat and backrest, the PT chair covers, offered in a variety of fabrics, vinyl and leather, can be replaced easily at the factory or on-site, if needed. To accommodate different statures we developed 3 seat sizes that differ in width and in depth. So whatever your size and shape we have just the right fit for you.